Speaking of parties, I keep hearing rumors that two people called William and Kate are getting married in England sometime soon. I don't know much about it, but I suppose it will be the typical wedding seen on all the blogs nowadays with one of those photo booths where guests hold up mustaches on sticks in front of their faces. If you'd like to watch this wedding on TV and make a party of it (or you're just nuts about British themes), download this set of printables from Design Editor. No plans... I'm afraid I'm not overly interested in the royal goings-on. But who knows, maybe I'll get swept up in the mania. These are great. 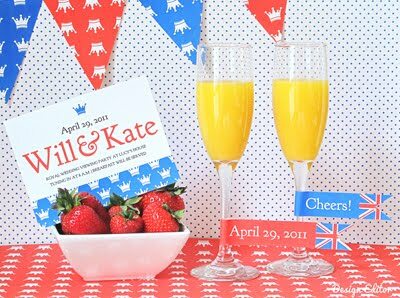 Boden also has fun royal wedding stuff, with printable bingo cards, invites, and a poster. Wow, they went all out! Fun. Bahahahaha @ photo booth with moustaches on sticks. I heard a lady at my work describing this being done at a churchmate's wedding and she wrapped up the description with, "It was so unique and original!" Hehehehe I love to read your posts + also your comments. See that your family is super into your blog + I love that. I though my family was the only crazy one that visited my blog even when they have no clue what a blog is. I find it so sweet + inspiring! Thanks always for the inspirations Jess. By the way I'm glossing + converting everything into magnets these days. I wonder where I picked up that addiction! I'm so excited for the Royal Wedding - everyone in England is going memorabilia crazy. Definitely using these for my street party! So cute! My husband thinks Im crazy being so interested in the Royal family but Im glad Im not alone ;-) Cheers mates. Hi. I just found your blog via Blog Guidebook and I just love it. Your stuff is beautiful, and fun. Just wanted to let say hi and let you know. Down with the Monarchy - up with the republic! Ceremony starts at 11 a.m. (i.e. 5 a.m. Eastern Standard Time in North America). Thanks for the link to the cute downloads! Cant wait for the wedding. Will be a moment in history and will be amazing to experience it. Sorry but I got the giggles are the "photo booth" comment. Can you just imagine?!? oh my gosh, this is over the top for 4am but I LOVE it! thanks for the find! Thanks for this - I live in the UK and am travelling 2 hours to my friends house to watch the wedding at hers. We have downloaded your pack, there will be bunting up and we will be having tea, cake and little sandwiches - and probably wearing tiara's too! These are really going to come in handy! I'm new to blogspot and I love your blog and crafts. I've made some of my own printables but I can't quite figure out how to post them on my blog. Any suggestions?... thank you. I like posting PDFs for people so they can get a clearer print (and a smaller file). But that requires someplace outside of Blogger to host the file, then you just link to it in the post. I don't think Blogger will let you upload a PDF. I'd suggest Google searching for recommendations on where to store PDFs. There might be some free services like Scribd, if you don't have your own website hosting with a server where you can upload files.